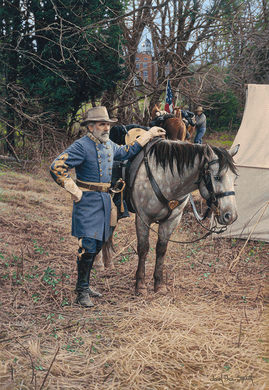 John Paul Strain Hand Signed and Numbered Limited Edition Giclee:"General Lee in Gettysburg"
Image Size: Paper 19.50 x 28.25/ Canvas: 16" x 23.5, 22" x 32" and 27.5" x 40"
Edition: Signed and Numbered Giclee - edition of 250 on Paper and 175 Canvas editions. About the Art: On the evening of July 1st the weight of the world was on General Robert E. Lee's shoulders. The decisions he would make over the next few days would decide the fate of the Confederacy and the future of the United States. Lee commanded the Army of Northern Virginia consisting of 65,000 battle hardened troops. His army had won or fought to a draw every major battle against the Federal army up to that time. Lee had within his grasp the fate of the nation. If only he could wield his mighty army with all its moving parts and personalities, and make the right decisions as he had done so many times before. -J.P.S. No thank you, I just want the 19x22 unframed print.